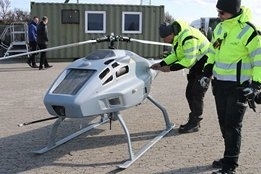 The Danish Maritime Authority (DMA) says it will deploy a new Sulfur-sniffing drone to patrol its waters in an area north of The Great Belt and help enforce sulfur regulations. By flying into a vessel's exhaust gas plume the drone can "sniff" its emissions, measure the sulfur content, and check for compliance with the prevailing regulations. Results are immediately available to Danish authorities. DMA says the drone performed its first sulfur mission in the area on April 11 and will see regular deployment in the coming months.